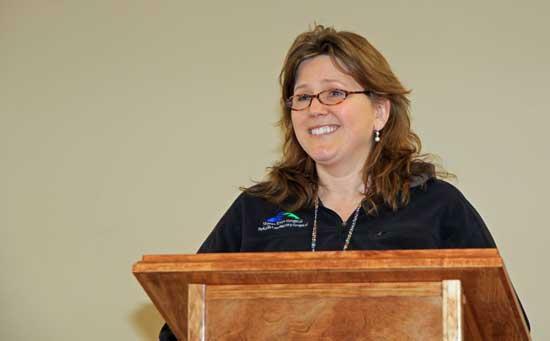 Stones River Hospital Director of Business Development Michele Fowler speaks to a group about health care at the Cannon County Senior Center Tuesday. How well you and your doctor communicate is one of the most important parts of your health care, Stones River Hospital Director of Business Development Michele Fowler told a group of local seniors Tuesday. Fowler addressed an audience at the Cannon County Senior Center on the topic of "Partnering With Your Doctor." She said that in the past communication between doctors and patients usually consisted of a one-sided conversation with the physician speaking and the patience listening, but said medical schools and hospitals have put a greater emphasis on changing that in recent years. "Now there is more of a give and take, because patients need to give doctors as much information as they can," Fowler said. "They need to ask questions and let the doctor know their symptoms and concerns." An accurate diagnosis of a patient's illness is important because "your health affects you in all aspects of your life and daily functions," Fowler told the seniors. • Speak up if you have questions or concerns. If you still don't understand, ask again. It's your body and you have a right to know. • Pay attention to the care you get. Always make sure you're getting the right treatments and medicines by the right health care professionals. Don't assume anything. • Educate yourself about your illness. Learn about the medical tests you get, and your treatment plan. • Ask a trusted family member or friend to be your advocate (advisor or supporter). • Know what medicines you take and why you take them. Medicine errors are the most common health care mistakes. • Use a hospital, clinic, surgery center, or other type of health care organization that has been carefully checked out. For example, The Joint Commission visits hospitals to see if they are meeting The Joint Commission's quality standards. "Finding a doctor, a primary care physician, who you can relate to and feel comfortable with is very important," Fowler said. She said patients should ask friends, relatives and other health care providers about any doctor they are deciding on seeing, make sure that doctor is a preferred provider with their insurance network if they belong to one, and call the doctor's office staff and ask questions about their services. During a visit to the doctor, Fowler advised the seniors to be honest, stick to the point, and share your point of view. "To give you the best care a doctor has to understand you as an individual so that they can know everything about you, or as much as they can, in order to prescribe the proper course of treatment," she said.